Most of us know that Disney is the epicenter for anyone young or young at heart. What can compare to the great fun you can have when you shop with a discounted Disney Store gift card? Remember your favorite character? Now you can find an array of items featuring that very character, and pay less money! And with merchandise and clothing featuring all your favorite Disney characters, you’re sure to find anything you’re looking for. In fact, they carry quality items featuring every character from Mickey Mouse to Moana- and everything in between! And the great news? Now you can spend less money for the same great merchandise! Dare to dream, to shop, and to pay less for all your favorite characters! Whether you collect figurines or hoodies, you’re sure to find everything you’re looking for and more! We all know about Disney, right? But did you know their first store opened in 1987, in Glendale California? And believe me, the chain grew fast. So much so, that as of 2016, there were more than 200 stores in the United States, with 120 additional locations worldwide. They are, in fact, a worldwide sensation. Purchase a discounted Disney Store gift card today and save money on clothes, accessories, toys, housewares and more- all featuring the very Disney characters you love! Maybe you know a little princess who needs a new gown? Then this is the card for you! Buy your discounted Disney Store gift card today, and save money on the same great character merchandise known the world over! And that’s not all. With departments in girl, boy, baby, and adult, you’re sure to find something for everyone on your list! But don’t forget, gift cards make excellent presents too! So, why wait? 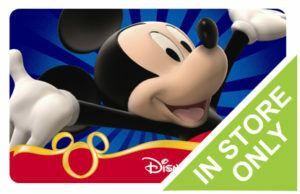 Buy your discounted Disney Store gift card and start saving money on all your favorite Disney gear! And that’s not all. Cards2Cash provides many other ways to save money. We offer discounted cards for lots of other popular retail shops! Check out our listings for American Girl, Crazy 8, The Children’s Place, Gymboree and more! With Cards2Cash, you can save money and still shop in the stores you love! Sell Your Unwanted Gift Cards Today! Do you have a Disney Store gift card you would like to sell? Cards2Cash will buy your unwanted gift card and pay you a high price for it! In fact, we buy gift cards for many retailers, restaurants, and websites! If you’re interested in selling a gift card, stop in one of our retail locations for on the spot payment OR simply fill out our easy online form, and we’ll get back to you with an offer you’re sure to love! With Cards2Cash, your gift card needs are covered!